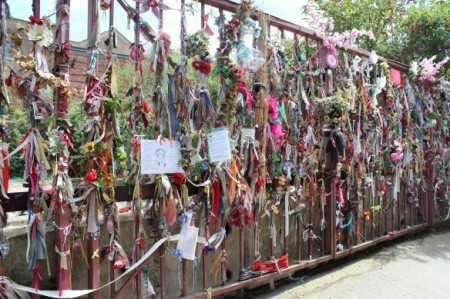 Cross Bones was home to the ‘outcast dead’, an unconsecrated ground used for the burial of prostitutes. London’s graveyards present a complicated story. The ones attached to churches were for Christians, but others were licensed in public grounds by private companies, so it’s not at all unusual to go into a small park in London and few a few gravestones stacked around the edges. The ladies of Southwark were known locally as Winchester Geese because they were licensed to ply their trade within the Liberty of the Clink in Southwark by the Bishop of Winchester. Despite this, they couldn’t be buried on consecrated ground or anywhere near a parish church. The age of the burial ground isn’t known, but it was mentioned in John Stow’s 1598 A Survey of London. It later became a pauper’s cemetery in 1665, the year of the Great Plague – and closed to burials in 1853 when it was declared over-full and a risk to public health and decency. Today the Memorial Gates are festooned with ribbons, cards and flowers – a tradition which only started in a 1998 ceremony – and small shrines have been placed on the site. The colourful, celebratory nature of these offerings adds to Cross Bones’ atmosphere, and a closer look reveals a statue of Mary in a grotto-like setting amongst trees, accompanied by a number of ornamental geese. Now the site is under threat as TfL seek to flog it off, because of course, we can’t have anything small and special and undiscovered, created by and for the people of London. Everything must be quantified and monetized and be seen to turn a profit. Who’ll mourn when it’s gone? I know that place, wtf are they playing at? I even know the place secondhand. Let’s hope is is Not sold. London needs to keep its history. Get Bryant out there with his stoutest cane. Yes, I remember the earlier mention. Burial places are fascinating research subjects, even at a distance. There is a current debate about where Richard III should be buried and strong statements are made about the Abbey, “because it’s where kings are supposed to be buried”. Well, Henry VIII isn’t, nobody after George I is, they’re all buried at Windsor, pretty much. (Excuse me, should save this for other realms. I just love your posts! Thank You. This reminds me of a term you used in The Invisible Code which I had never heard nor read before. Thankfully, it was footnoted (a la S. S. Van Dine!) in the text because the context alone left me a bit puzzled. It was “Sellotaph” – a brilliant neologism. We just call them roadside memorials. They can be tasteful, imaginative or tacky (Teddy bears strangled with plastic flowers all tied to a guardrail). But the display shown above is a quirky work of art. There was a sellotaph – and I really liked the term – down the road from us. It was there for the better part of a year and then a small plant appeared along with a wooden cross with the victim’s name. Now there is a set of very small logs bracing the back of the site so it looks as if the municipality is allowing it to stay permanently. There was a tree along the main highway memorializing First War deaths. When they came to straighten the highway the tree was in the way and they bent the road around it. I hope you don’t mind a little plug here for a charity appeal to restore a rundown Memorial Gardens for something very personal to me. I’m disgusted that the Memorial & Gardens haven’t been properly maintained and frankly not surprised Oil money hasn’t been forthcoming.